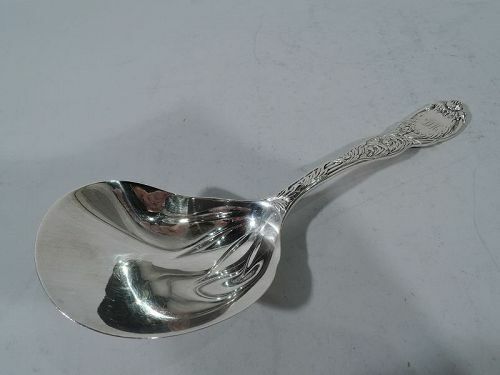 Antique sterling silver pastry server in Chrysanthemum pattern. Made by Tiffany & Co. in New York. V-form blade with serrated edge. Script monogram. An early piece in the classic Japonesque flatware pattern that was first produced in 1880. Hallmarked. Very good condition. 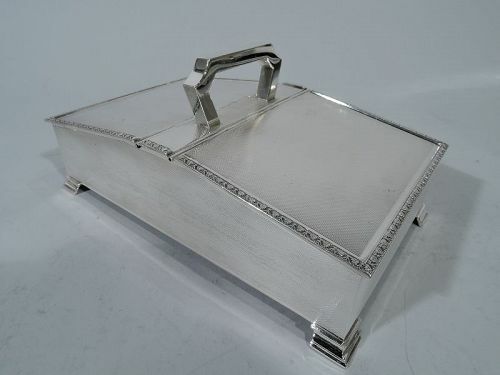 Art Deco sterling silver cigarette box. Made by William Henry Manton in Birmingham in 1964. Rectangular with straight sides. Bracket handle mounted to central panel between two sloping hinged cover. Allover engine-turned wave ornament. Top has leaf-and-dart border. Plain corner bracket supports. Box interior cedar lined. Hallmarked. Very good condition. 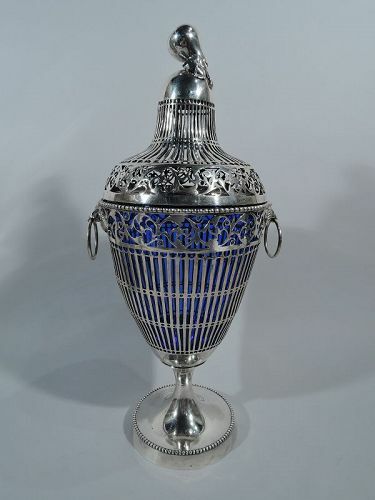 English cameo glass perfume with American sterling silver collar and cover. 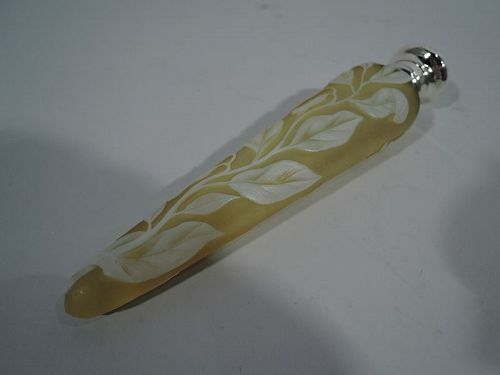 Yellow v-form vial with raised white vertical ornament: Sinuous stem with bluebell blossoms and leaves. On back is v-form leafing and branches. Cover threaded and engraved with same. 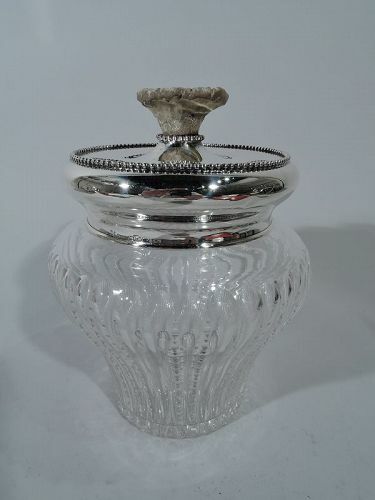 Clear glass stopper with frosted plug. 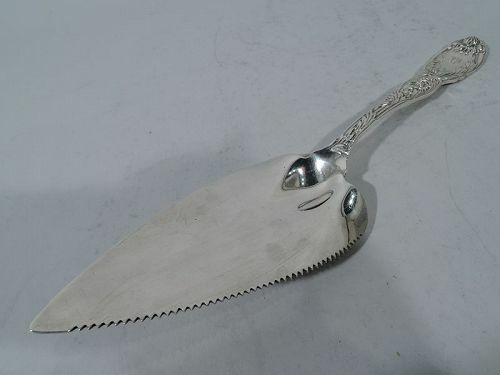 Hallmarked Theodore B. Starr of New York. Very good condition. Antique German silver chatelaine, ca 1890. Quatrefoil clip with reclining Classical male and the word honor. Three chains with ornamental links (flower baskets, dragons, and heads set in strapwork). 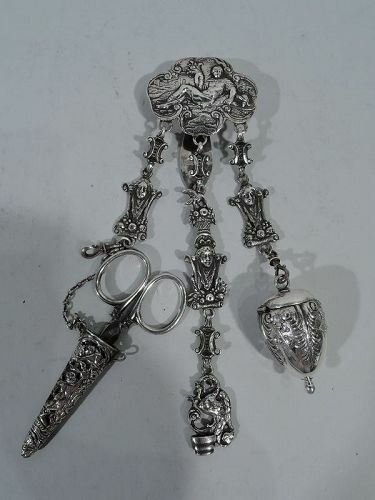 Pendant tweezers set in guard and acorn-shaped case containing silver thimble. For the lady of the manor – can be attached at belt and will hang gracefully in the folds of her best silk. Hallmarked. Very good condition. 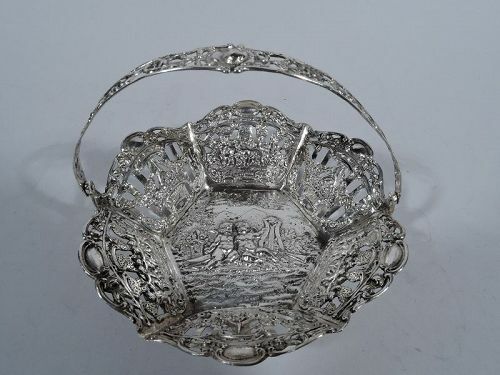 German Rococo 800 silver basket, ca 1900. Hexagonal well, tapering open sides, and swing c-scroll handle. Well has a pair of chubby cherubs seated next to a harp and horn. Sides have more cherubs holding hands in circles alternating with pendant flower baskets on trellis ground. Hallmarked. Good condition with minor losses. 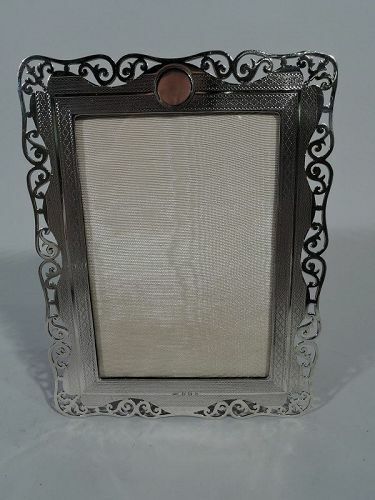 George V sterling silver picture frame. Made by Samuel M. Levi in Birmingham in 1914. Rectangular window bordered by wrap-around engine-turned ornament. Wavy rim with pierced scrollwork (loosely in form of volute capitals). At top is vacant circle. With glass, silk lining, and velvet back and hinged support. 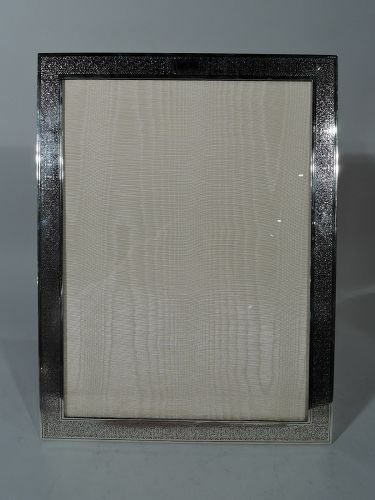 For portrait (vertical) display. Hallmarked. Very good condition. 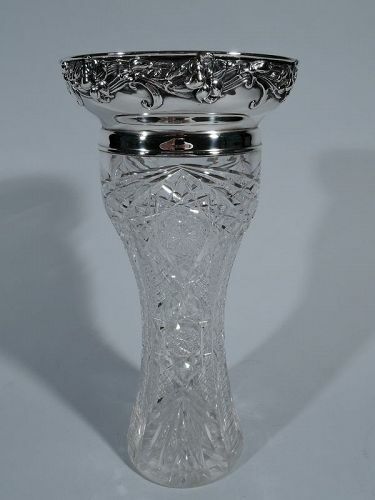 Art Nouveau brilliant-cut glass vase with sterling silver mount. Made by Gorham in Providence in 1906. Waisted cylinder with vertical ornament: stars, fans, diaper, and notches. 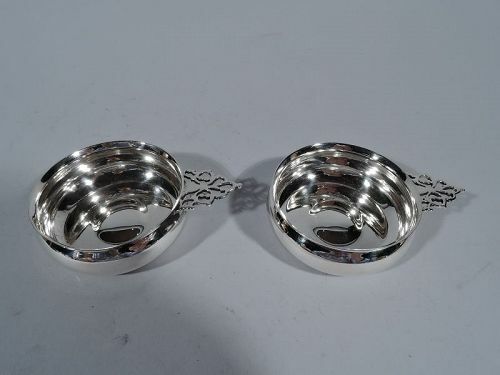 Sterling silver collar with surmounted by curved sides with floral garland applied to exterior. Pretty and tactile. Hallmark includes no. 1923D and worn date symbol. Very good condition.